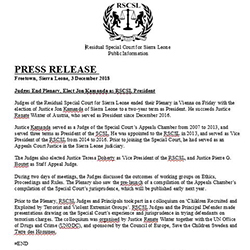 The Residual Special Court for Sierra Leone was established by an agreement between the United Nations and the Government of Sierra Leone to oversee the continuing legal obligations of the Special Court for Sierra Leone after its closure in 2013. These include witness protection, supervision of prison sentences, and management of the SCSL archives. This website includes and significantly expands the information contained in the original SCSL website. 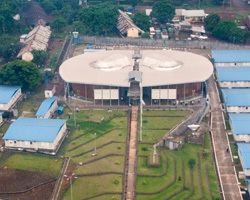 The Residual Special Court was established pursuant to an agreement signed between the United Nations and the Government of Sierra Leone on 11 August 2010. It was ratified by Parliament on 15 December 2011 and signed into law on 1 February 2012. The agreement stipulates that the RSCSL shall have its principal seat in Freetown,but shall carry out its functions at an interim seat in The Netherlands with a sub-office in Freetown for witness and victim protection and support. The RSCSL, like the SCSL, is funded by voluntary contributions from the international community, but the agreement permits it to seek alternative means of funding. The RSCSL has an oversight committee to assist in obtaining adequate funds and to provide advice and policy direction on non-judicial aspects of the Court. Unlike the Special Court, which at its busiest employed more than 400 staff in Freetown and The Hague, the RSCSL is a small body with about a dozen staff. The Act provides for a Chambers consisting of a President and, when necessary, a Trial Chamber and Appeals Chamber, along with the Prosecutor and the Registrar. For detailed information on the establishment of the RSCSL, see the Residual Special Court Agreement (Ratification) Act. A more complete discussion of the RSCSL's operations and mandate is provided on the RSCSL page. The Special Court for Sierra Leone was set up in 2002 as the result of a request to the United Nations in 2000 by the Government of Sierra Leone for "a special court" to address serious crimes against civilians and UN peacekeepers committed during the country's decade-long (1991-2002) civil war. Negotiations between the United Nations and the Government of Sierra Leone on the structure of the court and its mandate, produced the world's first "hybrid" international criminal tribunal, mandated to try those "bearing the greatest responsibility" for crimes committed in Sierra Leone after 30 November 1996, the date of the failed Abidjan Peace Accord. It was the first modern international tribunal to sit in the country where the crimes took place, and the first to have an effective outreach programme on the ground. The Special Court for Sierra Leone was the first international court to be funded by voluntary contributions and, in 2013, became the first court to complete its mandate and transition to a residual mechanism. Further information on the correspondence and UN resolutions relating to the establishment of the Special Court for Sierra Leone. The Special Court Statute empowered the Prosecutor to bring charges for war crimes (violations of Article 3 common to the Geneva Conventions and of Additional Protocol II), crimes against humanity, other serious violations of international humanitarian law, and certain serious violations of Sierra Leonean law. Materials relating to the Special Court's mandate are located on the Documents page. In March 2003 the Prosecutor brought the first of 13 indictments against leaders of the Revolutionary United Front (RUF), the Armed Forces Revolutionary Council (AFRC), and the Civil Defence Forces (CDF), and then-Liberian President Charles Taylor. Ten persons were brought to trial. Two others died, one of them before proceedings could commence (RUF Leader Foday Sankoh) and one outside the the jurisdiction of the Court (RUF Battlefield Commander Sam Bockarie). A third, (AFRC Chairman Johnny Paul Koroma), fled Sierra Leone shortly before he was indicted. While some evidence suggests that Koroma is dead, it is not considered conclusive and he is therefore officially considered to be at large. One person (Samuel Hinga Norman) died during the course of his trial, and proceedings against him were terminated. Nine persons were convicted and sentenced to terms of imprisonment ranging from 15 to 52 years. Sentences of the eight RUF, CDF and AFRC prisoners convicted in Freetown are being enforced at Rwanda's Mpanga Prison due to security concerns. The Special Court also conducted contempt trials in 2005 (relating to threats against a protected witness) and three trials in 2011-2013 (for tampering with Prosecution witnesses who testified in the AFRC and Taylor trials, respectively). In 2004, the Appeals Chamber ruled that the enlistment, recruitment and use of child soldiers was a crime during the period covered in the indictment. The Appeals Chamber also rejected a motion filed on behalf of former Liberian President Charles Taylor which challenged his indictment on the grounds of sovereign immunity and extra-territoriality. The decision cleared the way for Taylor's trial before the Special Court. 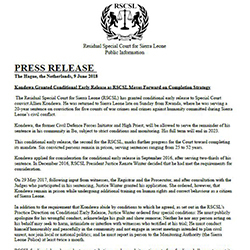 The Special Court for Sierra Leone was the first international tribunal to try and convict persons for the use of child soldiers (AFRC trial), for forced marriage (an other inhumane act) as a crime against humanity (RUF trial), and for attacks directed against United Nations peacekeepers (RUF trial). The Special Court was the first modern international tribunal (and the first court since Nuremberg) to indict, try and convict a sitting head of state (Taylor trial).